ALPHONSO TAFT was born in Townshend, Vermont, on 5 November 1810; attended local schools and taught school to obtain funds to study at Amherst Academy; graduated from Yale College, 1833; taught school at Ellington, Connecticut; held a tutorship at Yale while studying law; was admitted to the Connecticut bar, 1838; moved to Cincinnati and commenced the practice of law, circa 1840; married Fanny Phelps, 1841, and, after her death, Louisa Torrey, 1853; was appointed to the superior court of Cincinnati to fill a vacancy, then elected to the post for two terms, 1865�1872; resumed the practice of law, 1872�1876; served as Secretary of War, 8 March�22 May 1876; was appointed attorney general of the United States, 1876�1877; was an unsuccessful candidate for governor of Ohio, 1875 and 1879; served as minister to Austria-Hungary, 1882�1884; served as minister to Russia, 1885�1886; died in San Diego, California, on 21 May 1891. 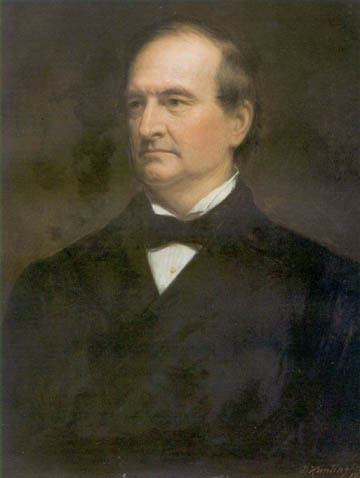 Daniel Huntington (1816�1906) had completed four of his seven decades as a working artist and had secured his reputation as a portrait, historical, and landscape painter when Secretary Alphonso Taft sat for him during the nation�s centennial year. The Army increased the fee for secretarial portraits from $300 to $500, effective with Huntington�s work on Taft, an increase fully justified in light of the additional requirements of painting from life�requirements involving appointments, sittings, and approvals.